The Infertility Overachievers: Mother's Day Giveaway!! Mother's Day is quickly approaching. For some this is a joyous day filled with celebration, but for others it is just plain torture. This year I think we should celebrate together. Whether you have a living child, an angel baby, or are the midst of trying to conceive or adopt, we are all MOTHERS in our heart. Cliche I know, but it is so very true. A few months ago, you might remember, I got my very first "mommy" necklace. I loved it (and still do). One day I just happened to stumbled across Bugaboo jewelry. I immediately loved Kristi's jewelry, but it was her message that really spoke to me. 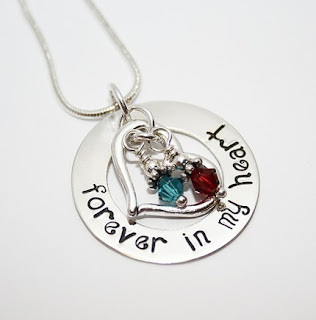 She specializes in miscarriage, stillbirth and pregnancy-infant loss jewelry. She also donates a portion of her proceeds to an organization that offers financial aid to couples going through fertility treatments or adoption. How amazing is that? I am extremely excited to announce that Kristi has been generous enough to sponsor a Mother's Day Giveaway here at The Infertility Overachievers. Now through Mother's Day (May 9, 2010), you can enter to win this amazing necklace. This piece is made to order so it can be customized just for you. You can change "forever in my heart" to a different phrase, name, or even date that is meaningful to you. This is a piece made just for YOU this Mother's Day. Everyone is welcome (and encouraged) to enter. Contest will end on May 9, 2010 at 11:59 pm EST (Mother's Day). Winner will be drawn and announced on May 10, 2010. All entries must have a valid email address listed for contact (or listed on your blog/twitter). Winner must respond within 72 hours or a new winner will be drawn. Aly, LOVE the necklace! I've been wanting one ever since you told me about yours. I visited bugaboo's etsy page and my favorite piece is the Love you to the Moon necklace. Its kinda embarrassing but I teared up a bit when I saw it :-) And I visited the Bundles of Hope page. What a neat community and support system! Entry number two for Les! I love the Always In My heart necklace with the name on it. And I already stalk you!! And I follow you on Twitter. AND I retweeted it!! Entry #3 for Erin. Follower. I am a new follower. I like the Mommy Birthstone Necklace. I love the forever in my heart necklace and the infant loss memorial bracelet. Either one is a wonderful way to remember the little ones we have lost. I visited the bundles of hope page. I just posted a blog about your giveaway and the other two sites. Entry #2 for KC for blogging about this. Entry #2 for Kittygirltx for following on twitter. My favorite item would either be the small handprint square pendant or the mother's charm necklace. I've been wanting to get one that I can add to since I had my first son. I visited Bundles of Hope. Great cause! Hey Aly! I can't believe your little guy is over a year old now! That's crazy. I totally still stalk you on MDC although I am much less active. IF and loss has really taken its' toll on my marriage so we're off the baby train for now. I absolutely love the footprints on my heart necklace and if I don't win on here somehow then I am most definitely buying it for myself. Sorry about the BFN today! And I went to Bugaboo jewlery and I love the sterling silver 4 sided pendant!!! Would be perfect for me. Alright, I just HAD to make a donation cause they are based right HERE in CO!!! Thats awesome!! I even know where Littleton is, lol. P.S. I now follow you on Twitter! I am a new follower and really like the Hand and Foot prints - Square Glass Pendant!